State Parties, Nonprofits, Super PACs Spending Big To Help Decide Which Candidates Should Represent Michigan In The State Legislature. LANSING (NOV. 5, 2018) — The number of $1-million races for the Michigan Senate has reached a new peak in 2018 as donors have poured money into the fight for control of Lansing. State senators represent about 240,000 people each in Michigan. They serve four-year terms. All 38 Senate seats will be on the ballot on Tuesday, Nov. 6. The last time all 38 Senate seats were on the ballot was 2014. That year, only three individual Senate races crossed the $1-million threshold for candidate fundraising and disclosed spending by groups working independently of the campaigns. In 2010, there were six $1-million races. In 2006, there were five. This year’s election is shaping up to be quite different. While the numbers aren’t final and will only go up, already 10 of the 38 Senate races have crossed the $1-million mark, according to a new analysis of campaign finance disclosures, including late contributions reported over the weekend. The statistic is an example of the expensive battle for power that’s playing out this fall as Michigan Republicans look to keep legislative majorities they’ve held since 2010. Democrats are pushing to win their own majorities. Currently, Republicans hold 63 of the 110 seats in the House. Republicans have an even larger margin in the Senate, where they control 27 of the 38 seats. The main fundraising committees of the House Republicans and Senate Republicans have had a financial advantage in 2018. Of the 10 most expensive House races and 10 most expensive Senate races, GOP groups and candidates have outspent or out-raised their Democratic counterparts in 14 of them. Republicans have had a particular advantage in the Senate, where the GOP groups and candidates have outspent or out-raised Democrats in eight of the 10 races. The following is a look at the Senate races and House races drawing the most money so far this fall. The numbers are based on campaign finance disclosures by the candidates, disclosures from PACs on their independent spending and an analysis of unreported TV advertising through data from Kantar Media/CMAG and Federal Communications Commission filings. These ads don’t expressly tell viewers how to vote so they don’t have to be reported in campaign finance disclosures, but they do either promote or criticize a candidate. So far, the Michigan Campaign Finance Network has tracked about $2.2 million in these so-called “issue ads” in races for the Legislature this fall. Only ads that MCFN could directly link to races were included in this tally, and the numbers are dependent on the filings of TV stations. 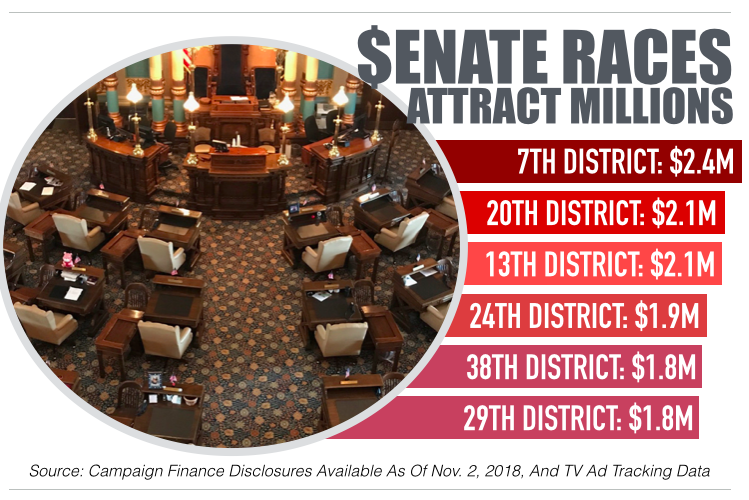 All of the numbers will change as new disclosures become available and as MCFN continues to track TV ads running in the final week before the election. The final numbers for how much money poured into these races won't be available until February 2019. 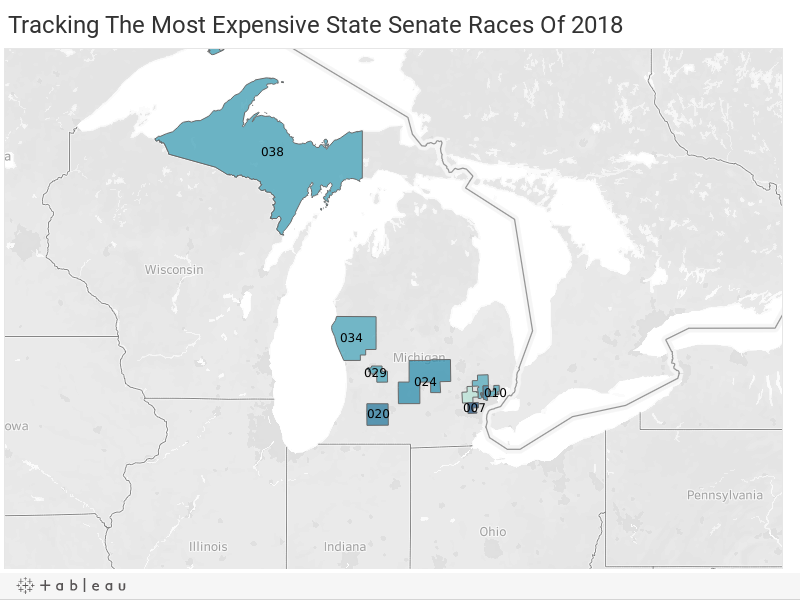 Click on districts within the maps to see a breakdown of where the money is coming from in the 10 most expensive races. The Livonia-area 7th District race has been the most expensive Senate race so far largely because of heavy investment from Republican forces looking to keep the seat in GOP Hands. The campaign of Rep. Laura Cox, a Republican from Livonia, has amassed about $1.1 million, including direct support from the Senate Republican Campaign Committee, which has invested more than $700,000 in the race, according to campaign finance disclosures. The Michigan Chamber of Commerce’s super PAC reported spending $77,900 in support of Cox. And a nonprofit run by GOP consultants called Michigan Citizens for Fiscal Responsibility has aired an estimated $286,000 in TV ads in the race, according to filings with the Federal Communications Commission. That nonprofit, which doesn’t disclose its donors, has aired ads in eight different state Senate races this fall. The campaign of Democrat Dayna Polehanki, a teacher form Livonia, has raised about $592,000, including support from the Senate Democratic Fund. A PAC called the Michigan Leadership Committee has also spent about $112,500 in support of Polehanki. 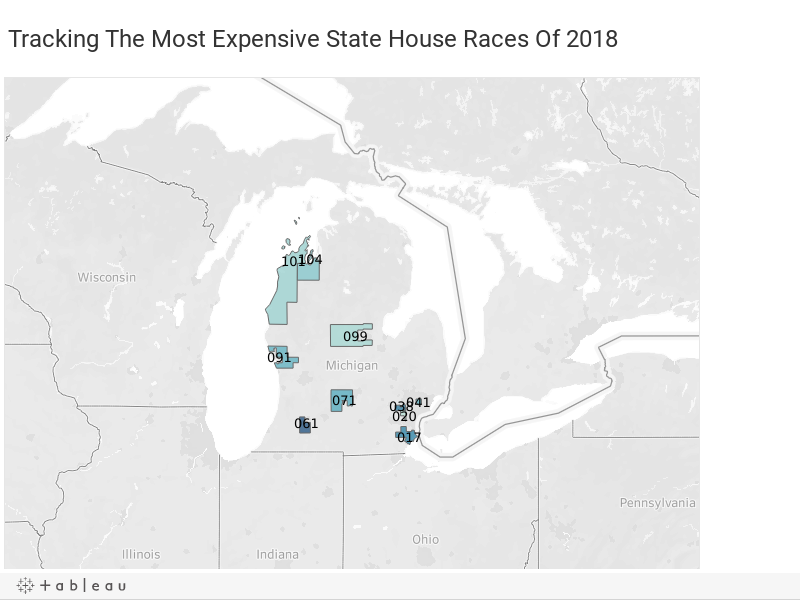 The 2018 race between incumbent Rep. Brandt Iden, a Republican from Oshtemo Township, and Democrat Alberta Griffin, an instructor at Western Michigan University, is shaping up to be among the most expensive state House races in Michigan history. The House Democratic Fund, the caucus committee of House Democrats, has invested about $255,000 in Griffin’s campaign to flip the seat while the House Republican Campaign Committee has spent about $383,000 in support of Iden. The Michigan Democratic State Central Committee has also been airing ads in the district to help Griffin (an estimated $43,000) while the Michigan Chamber of Commerce’s super PAC has been spending to help Iden ($78,932). In the final days before the election, a nonprofit called Citizens for Energizing Michigan’s Economy began airing ads promoting Iden. Its spending hasn’t been added to the final tally yet.